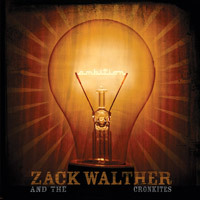 Texas music fans eagerly awaiting Zack Walther and the Cronkites' new CD, Ambition, will not be disappointed. Zack Walther and the Cronkites have definitely left their mark on the central Texas music scene. Fans have witnessed the Cronkites' Texas rock sound, that can take you from a beautifully written love song with a perfect southern harmony to standing on tables turning Cronkite originals such as the new "Money Tree" into crowd favorites. Frontman Zack Walther's big, Hootie and the Blowfish-esque voice and steady rhythm guitar paired with Luke Leverett's maniacal guitar solos make the band's new CD even more en-capturing than the last and provides a show even the almighty KISS would find entertaining. The quartet would not be complete without Chris Compton, who has great skills on the skins, and Steven Joe, who thumps the bass in a very tight effort with Chris. The band's new CD was funded by something they call Executively Produced by You, which allows fans to donate money and receive special items, including a drawing for a private show! The new CD includes captivating new songs such as the well anticipated "Mountain Laurel," and their new single "Georgia Cane." Zack Walther's award-winning song writing style shines through immensely on Ambition. The CD will be released in February of 2009, however the "executive producers" will receive a copy in late October. Fans have been waiting well over a year for Ambition, but those fans will not be disappointed with this newest addition to the Cronkite collection.